Gerald Durrell’s book “My family and other animals” was one that I loved and read over and over as a child so I was thrilled when it popped up as a series on BBC recently to be enjoyed all over again. 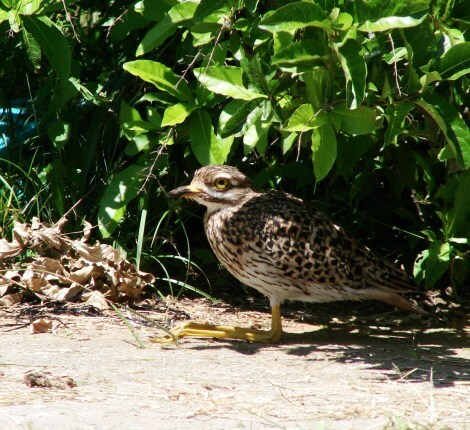 Other than the resident dogs, chickens, frogs, fish and an interesting selection of birds our own home has on occasion hosted a baby Spotted thick-knee (dikkops), ducks and a family of Egyptian geese. There have also been some particularly special visits. There was a solitary chameleon that made an appearance at least once a year for five years and then disappeared into the undergrowth; and a brown house snake we invited to stay and who should still be here somewhere. Leyla dropped a hedgehog on the couch about a year ago and judging by the dogs’ behaviour, there are still more of those around. And then last week I saw a bush baby (or what I believe to be a bush baby) swinging through the upper branches of the trees en route to its nocturnal stomping ground. It's nice to think that our garden with its various mini-ecosystems and associated goggas is so attractive to the local wildlife and that we are doing our bit for the planet. 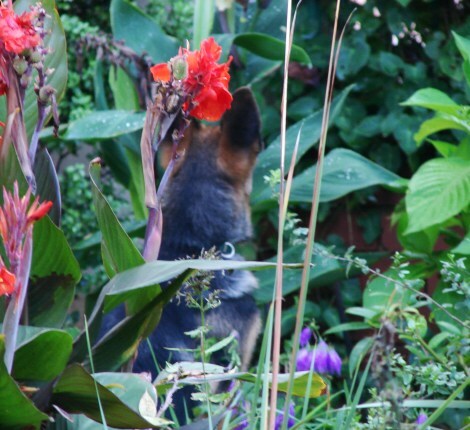 Deciding to get a little more scientific about it, I looked up on the internet what once can do in the garden to make it a welcoming environment. For those gardeners who don't mind sacrificing some tidiness for a higher purpose, here is what I found. Use ornamental plants that provide a food source over a long period. Include nectar- and pollen-rich plants for bees, butterflies and other flower-visiting insects, and fruiting trees and shrubs for mammals and birds. Night-flowering or scented species will benefit moths. Create a log pile to benefit insects, fungi, birds, mice, hedgehogs, slowworms, newts and toads. 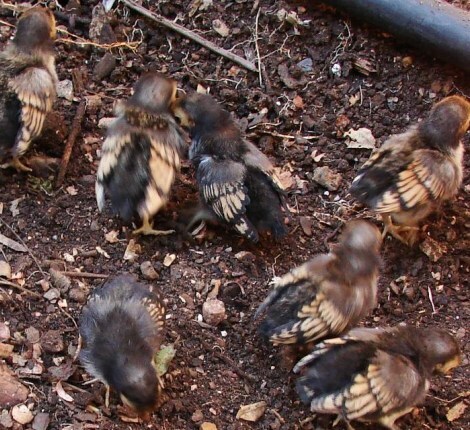 Leave some plants uncut throughout winter to provide seeds for food and shelter to birds and other creatures. Reduce the use of chemicals, particularly to control insects. All insects are an important part of the natural food chain in your garden for other wildlife to feed on. A water feature (a washing-up bowl set into the ground will do) without fish will enable frogs and newts to spawn. They will return the favour by eating slugs and snails. Reduce the size of your lawn, or consider leaving part of it uncut. Long grass can be beneficial to many species. Alternatively turn all or part of your lawn into a wildflower meadow. This will require careful management but will provide food and shelter for wildlife of all kinds. Attract bats and hedgehogs by providing specially built boxes comfortable enough for hibernation. Put out a variety of nuts, seeds and fat balls to attract birds when natural food sources are scarce. They will at the same time eat the bugs and aphids on apple trees. Ivy, honeysuckle and clematis and other climbers along with hedges offer shelter and potential nesting places for birds and overwintering sites for butterflies. We are having wonderful autumn days and despite the exceptionally high temperatures the deciduous trees and shrubs are starting to lose their leaves. The combretum Vaderlandswilg is dropping bagsful every day and no doubt Robert will insist that we clean up before the family arrives for their annual visit next week. We have moved our bearded irises to the sidewalk garden and I have visions of yours truly sitting up all night to keep watch for “predators” when they are in bloom. The Pentas are looking gorgeous – such an underrated plant! The iochromas are also looking great with their clusters of tubular flowers. 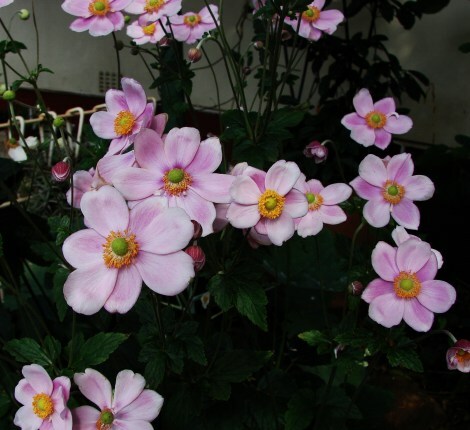 A real autumn treat is of course the Japanese anemones or wind flowers which are like ballet dancers in the garden. They must be one of my favorite flowers. Click here to view all the plants featured in this newsletter. Helichrysum cymosum is a gorgeous perennial ground cover with woolly stems and small aromatic silver leaves and clusters of yellow flowers from summer to autumn. It is evergreen and very hardy and is happy in sun or semi shade. Dyschoriste thunbergiiflora is a rounded 120 cm high waterwise shrub with deep violet trumpet shaped flowers in summer. It is evergreen and semi hardy and can take sun or semi shade. An attractive dense self-seeding shrub with spikes of yellow orange flowers that attract birds, butterflies and bees from summer to winter, Metarungia longistrobus is indigenous to Mpumalanga and Limpopo. Evergreen and hardy, it grows on average 100 cm high and likes semi shade. It makes a good container plant. Rotheca myricoides cv Ugandense (with the more manageable common name of Blue butterfly bush), is a fast growing evergreen shrub with butterfly like blue purple flowers all season that attract birds and carpenter bees. It can take sun or semi shade and, with an average height of 200 cm, makes a good screening plant. It is semi hardy. The Anemone September Charm is a suckering deciduous perennial that originally hails from China. With oval palmate mid green leaves, it has gorgeous slightly cupped pink flowers in autumn that do well in the vase. Loved by butterflies, it is very hardy and likes semi shade. 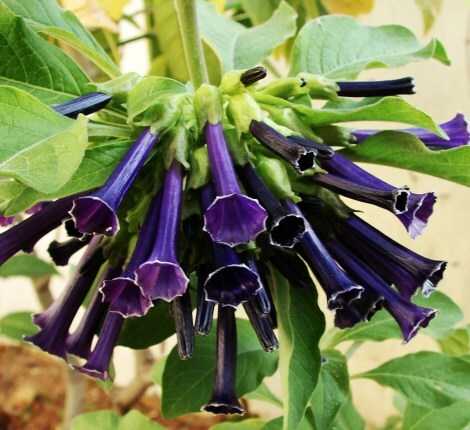 Iochroma cyaneum is a fast growing evergreen shrub with large leaves on lax branches and narrow dark purple trumpet shaped flared flowers in summer and autumn. It wants full sun, is semi hardy and grows to a height of about 300 cm. If you would like to try your hand at growing orchids, try the Jewel orchid or Ludisia discolor. This hardy evergreen with velvety textured maroon leaves is easy to grow and provides lovely sprays of white flowers from winter to spring. A clump forming perennial, it reaches a height of about 50 cm and likes shade to semi shade. A soft stemmed evergreen perennial from Brazil, Ruellia macrantha has bright green lance shaped leaves and showy rose pink flowers from autumn to winter. It is semi hardy, likes part shade and reaches an average height of 60 cm. Take note of the Autumn Garden Show happening at the Herb Farm in Midrand from 5 t0 7 April.